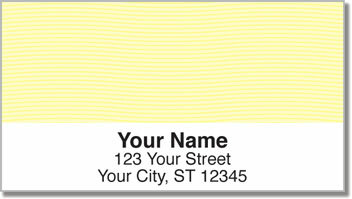 Give your letters and packages a uniform look along with a burst of cheerful color when you add these matching return address labels to your personal check order. The style matches our always-popular Safety Check design, a traditional best-seller. Now we've created a line of matching labels so all your mail looks polished - inside and out! Besides looking sharp, you'll also be saving a ton of time. That's because these are self-adhesive labels. So just stick them on every envelope and move on with your day. It's a trouble-free solution to an often annoying chore. Get your own Yellow Safety Address Labels right now! Look for five other color choices in both checks and labels.